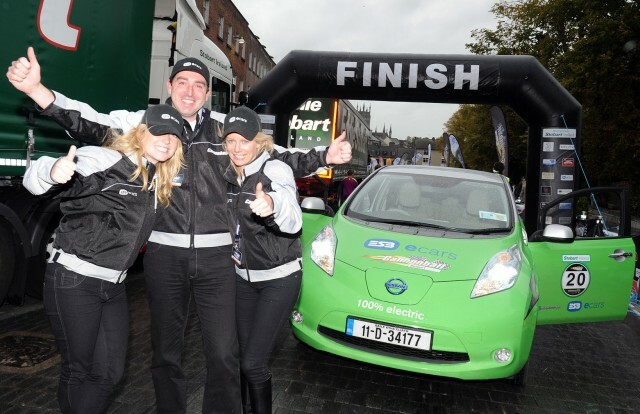 A few weeks back we brought you news that a team entered into the famous Cannonball Run, this year held in Ireland, would be doing the trip in a 2011 Nissan Leaf. We missed the end of their journey as the excitement of the Frankfurt Show got in the way, but we're pleased to report the ESB ecars team made it to the finish at Kilkenny with no problems, nestled amongst Ferraris, Corvettes and all manner of other exotica. The route took in more than 600 miles of green Irish countryside and was visited by more than 100,000 spectators. The team's aim was to promote electric car travel in Ireland by proving the existing charging network is suitable. The team kept a video diary over the three days of the trip. Check out the three short videos below. The ESB team's Nissan Leaf is the first electric car to have entered - and completed - a Cannonball Run anywhere in the world. Last year's run raised over $330,000 for charity, helping children suffering from cancer.